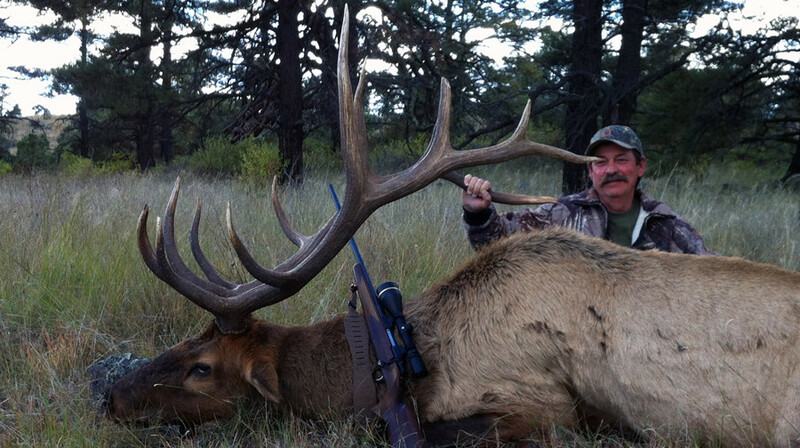 We offer guided New Mexico elk hunts in the Lincoln National Forests units 34, unit 36 and unit 37. 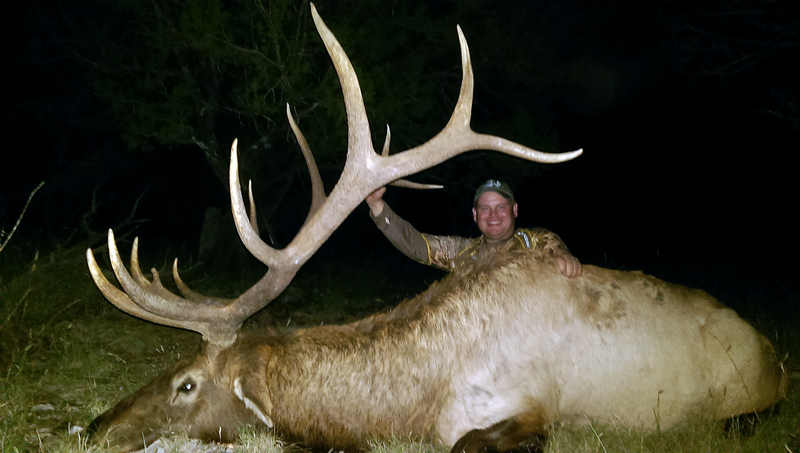 These are some of the best units in the state that provide the highest success rate of any of our guided New Mexico elk hunts. One of the best things about hunting in unit 34, unit 36 or unit 37 is the number of shot opportunities hunters will have on any of the Guided bow, muzzleloader or rifle hunts. Unit 34, unit 36 and unit 37 hunts also offer hunters the chance to hunt in units with lots of 285-320 bulls and a realistic opportunity to harvest a 330-350+ bull on any given day of the hunt. We also have a number of pure trophy hunters who focus on unit 34, unit 36 and unit 37 for monster bulls on rifle, muzzleloader or bow hunts. Guided bow hunts in unit 34 hunters have taken 380-355-360-372 bulls in just the last few years and almost every year hunters return to camps with stories of monsters in the woods. Guided rifle hunters in unit 34 enjoy our highest success rates as well as highest encounter or opportunity rates. Our unit 34 guided hunters have been near 100% opportunity and pushing 90% success rates this last 5 years here. Unit 36 and Unit 37 offer the same great hunts, just much more physical. You better be in shape to hunt 36 or 37. We start with guided bow hunts, leading into youth only, followed by Muzzleloader and then rifle. We have guides on the ground in unit 34 every year from the first day of bow season until the end of January. Our guides almost know the elk by name and for sure by the sound of a bugle before the season is over. We have enjoyed high harvest rates on bulls in the 285-320 class with a real shot at 350 possible on any given day. Hunter opportunity rates are as high as 100% most seasons. Hunts are glass and stalk and calling, mixed with a little waterhole hunting amongst the ponderosa, pinion and junipers of the area. We hunt from 6,000-10,000 foot elevations allowing us to be where the bulls are. We hunt from high mountain country to the lowland desert scrub brush country. 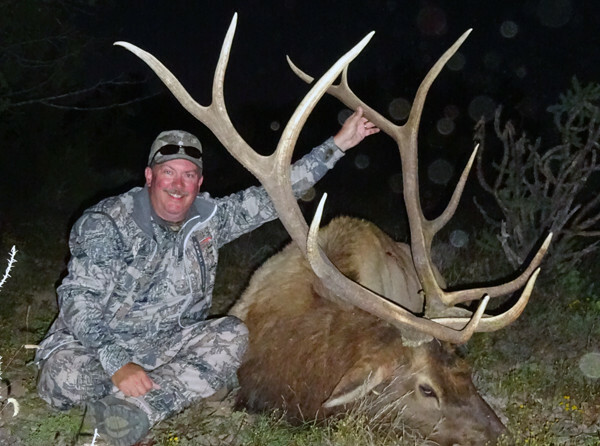 Unit 36 and unit 37 muzzleloader elk and rifle elk hunts offer you the chance to hunt the earliest hunt dates in the state for premium units. Overall, this hunt has good draw odds as well as some of our highest harvest rates. There are a good numbers of landowner tags for these units as well, allowing you to plan a hunt with no draw. We always have unit wide landowner tags in this area as well as the 50,000 acres that we lease for private ranch hunts. December Guided Bow Hunt: 7 Day, 6 x 6 or better only. This is an over the counter tag that is sold later in the year and is first come, first served. 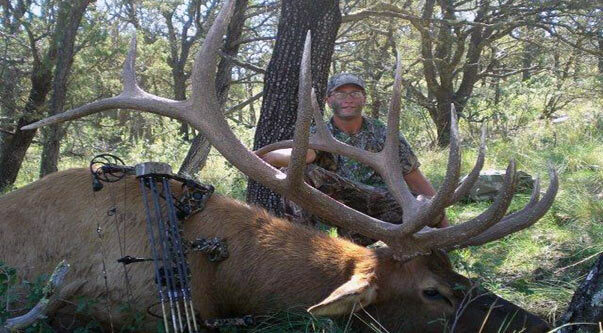 We have had great success getting tags for this hunt – it’s a spot and stalk challenge any bow hunter will relish!